Ceanothus 'Trewithen Blue' is a fantastic evergreen tree with profuse, dark-blue summer flowers emerging in clusters from April through to June. Ceanothus, also known as Californian Lilac, are very popular with bees and other pollinating insects, due to the masses of flowers that cover them. It can be grown as a climbing shrub, but we offer it as single stem or multi stem trees that create wonderful small trees reaching up to 3m in height. Note you can still train it against a wall as a climber, fan or espalier if you wish. If you're looking for a Ceanothus for your patio, see Ceanothus thyrsiflorus repens. 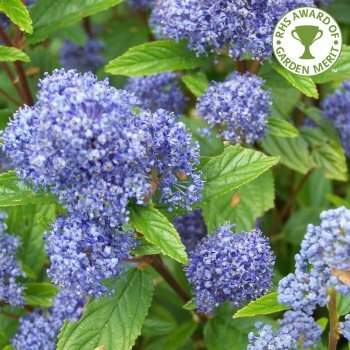 Ceanothus 'Trewithen Blue' is great for year round interest, with its profuse blue flowers and evergreen foliage that provides a great, dark-green foil for other neighbouring plants. Ceanothus require a well drained soil a sunny situation, that is not exposed to drying winds. Our pot grown Californian Lilac trees can be planted at any time of the year. Start by removing weeds and grass within a metre of your desired planting hole. Dig a square hole as deep as your root mass and approximately 2x as wide. To help the tree establish more effectively, sprinkle root grow in the hole. Remove the pot, gently loosen the roots and place into the planting hole. Mix 50% of the original soil with 50% compost, fill in the hole and firm around gently. Avoid banking the soil up around the collar of the tree. We recommend planting Ceanothus trees with a stake and tie - instructions are in the planting guide. If you’re planting Ceanothus in spring or summer, water well for the first few months. Increase watering if there are extended periods of hot or dry weather. If planting in autumn, you may only need to water a little. Irrigation kits make it easier. Ceanothus trees do not require a lot of pruning. Simply remove any dead, diseased or awkwardly placed branches from the tree as and when you see them.